In a world filled with beige interiors, Morocco is the perfect antidote: a refuge for addicts of saturated colour, a haven for devotees of intricate pattern, a destination for admirers of striking architecture. For anyone who wants to add Morocco's spicy design mix into their own home, Maryam Montague, the personality behind the award-winning blog My Marrakesh, explains how to do so with the building blocks of Moroccan design—from the colours, patterns, and textiles to the archways, fountains, gardens, and so much more. With illustrative text and gorgeous photographs, Maryam shows how Moroccan design comes to life in real villas and riads and in her own magnificent home and guesthouse. Eager DIYers will love the ideas presented in sidebars and in how-to projects that can be applied to homes anywhere. 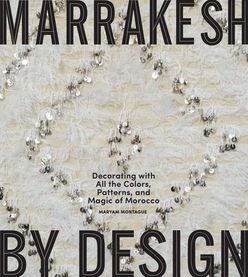 Filled with all the richness of Morocco,Marrakesh by Design will transport readers straight to the souks and salons of this exotic city while showing them the multitude of ways to live with the enticing elements of Moroccan design.